COMC has many benefits that attract a wide variety of customers: the offer system, high quality shipping, and world class customer service. On top of all that, there is a major draw that pulls in collectors the world over: the option to buy cards over time, build up a collection, and then ship it out as one big package. That’s right, on COMC, you can buy items now, save them in your account while storing them at COMC, shipping them to you, as one package, at your convenience! This unique value proposition has been available since the beginning of CheckOutMyCards.com and continues to the present day. And the number of ways that this part of the service is used has expanded. First and foremost it allows you to save on shipping costs. If you had to have each and every item from each and every seller shipped separately, the cost in shipping would be astronomical! 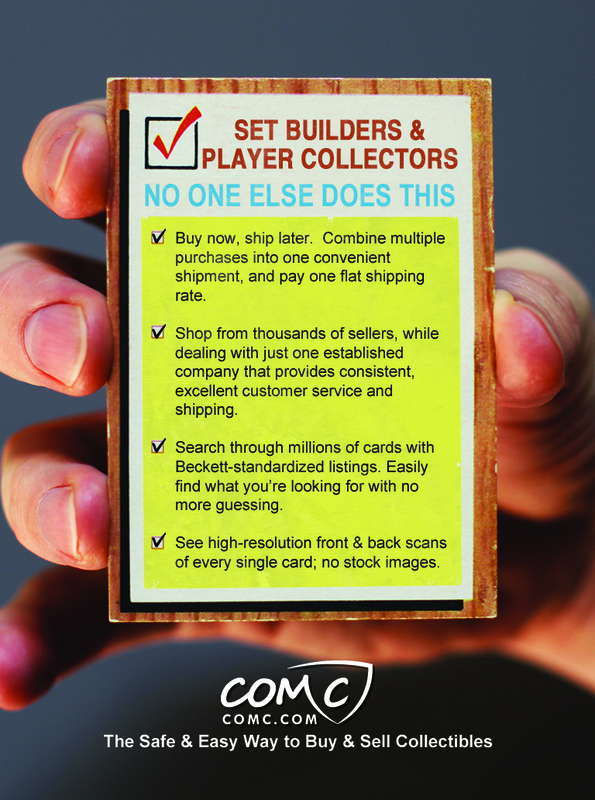 In an earlier blog post, we explored how COMC is amazing for set builders and collectors, and how we have already been noted as one of the best! However, saving on shipping is only one reason to make use of the service. Here are a few other ways that our buyers have found to take advantage of Buy Now, Ship Later! When you are planning on going to a trade show there are two things you can often count on: you’re going to see the same vendors, all selling the same stuff. So what is a discerning trade show vendor going to do? Well, many COMC customers will purchase items on the site over the course of the month and slowly build up a new trade show batch that specifically has cards that have been hot over the last few weeks. Then, a week before the show, they have these cards sent to them and voila! They have a hot set of new items for the show. It’s nice to have some of the best in show, and COMC has helped many of our users achieve just that. This happens to almost all shop owners, where they find themselves with a batch of cards from out-of-market teams. In the past, those cards were slated to sit in the display case or in a box in the backroom, as no one shopping in your southern California shop had any interest in that stack of New York based teams. However, with COMC, shop owners have begun to purchase cards specific to their markets as they come on sale, and once they start getting asked by their customers if they have some of these “out of stock cards,” they place an order to ship. Then, they send the cards that will likely never sell in their shops to COMC, and a shop owner on the other side of the country has the opportunity to meet the needs of their markets. 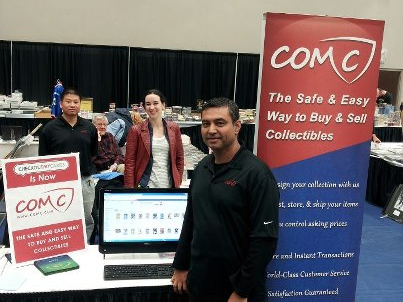 COMC provides brick-and-mortar stores the online marketplace to dispense with the cards they don’t need, and a way to build up an online inventory of the hot items from their local teams. That is a pretty slick way to run an online business for your store without the hassle of setting it up yourself. Everybody has that person in their life that is… a little hard to buy gifts for. And if they happen to collect very specific cards, the difficulty only gets worse. Some of our users have found COMC to be the perfect place to fix this problem. 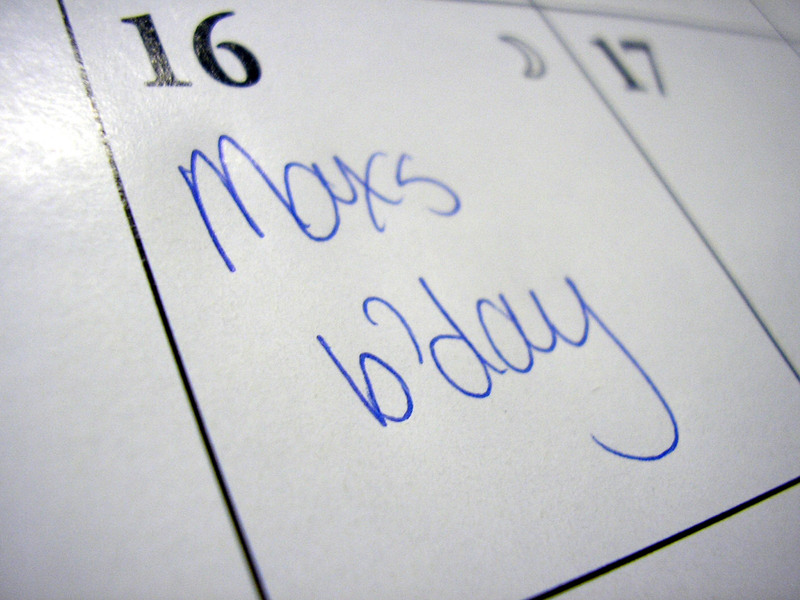 Say your friend only collects one very particular card and their birthday is in 6 months. Well, if you see one of his cards pop up on COMC, you can add that to your inventory. And then when another pops up, you can do it again. Then when that birthday rolls around, you have the whole batch that you have slowly been accumulating sent to him, and that is a mighty fine gift. Maybe your favorite team is coming to town and you decide it’s time to get some autographs. But maybe you don’t have a card for every player that you want to meet. Or perhaps you’re taking a trip to see them play on their home field. COMC has made building this collection many times easier. Autograph devotees have found COMC to be a godsend: They build up a collection of cards from several different sets and have them all bundled together and shipped to where they will be to get the autographs they need. This makes it a snap to have the right cards, for the right players, at the right time. So how many other ways can Buy Now, Ship Later be used? We want to know what you use this option to do for your collection. Feel free to leave your comments below and keep following us on the blog, Facebook, Twitter, and our new Google+ page. It wasn’t long ago that we unveiled a new advertisement going into Beckett and other major subscriptions. Today, we wanted to give you a sneak peek of an ad that will be hitting the shelves very soon and give you a chance to earn some store credit to boot! 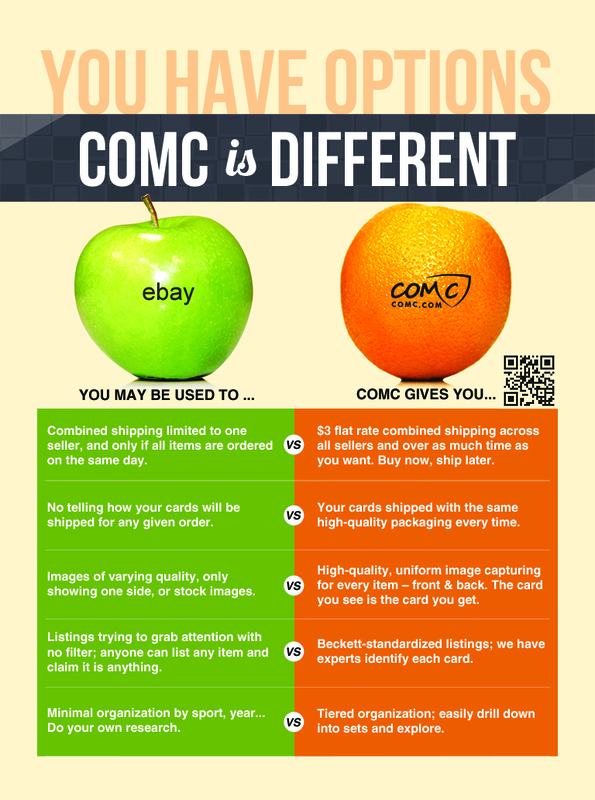 At COMC, we frequently have customers compare us to ebay, and we thought it would be nice to highlight some of the things you have told us, and maybe some of the things you might not know. But the honest truth is, comparing us to Ebay is like comparing….well I think you get it. From June 8th to June 12th, we will be running a contest on Facebook. Every user who shares this image on their Facebook page will be entered into a drawing. The pot will be worth $5 + $.25 for each share this image has received! The winner will be announced on June 13th on Facebook. So tell us, what do you think of this ad? Please leave your comments below and keep following us on the blog, Facebook, Twitter, and our new Google+ page. Don’t forget to Share us on Facebook for a chance to win the contest! Lastly, if you haven’t already heard about The Vault, check out our blog post and see how you have another option for your high end cards now as well. One of our top priorities at COMC is to get to know and really understand our customers. Needless to say, we were thrilled to attend Mosaiq’s talk at The Industry Summit about the results of their 2013 Trading Card Consumer Survey. We were happy to hear COMC was represented in the survey and were fortunate to learn how trading card consumers see us and what they expect from their experience with us. An enormous selection of items courtesy of our consigners. With over 6 million items and growing, you have a good chance of finding cards of your favorite player or from that set you’re building. A one-of-a-kind system that allows you to buy now and ship later! Where else can you purchase just the one card you need without having to find a number of other cards just to meet a shipping quota? Instead, you can buy the cards you want, when you want, and have them shipped together at a later time for one flat rate. Standardized listings and tiered organization which allow you to easily drill down into sets and explore. Of course, high resolution front and back scans of every single item, so the card you see is the card you get. Let’s be honest, this is pretty exciting. In order to make sure everyone understands just how different we are, we created an ad that will appear in several magazines, as well as on the web. How about you? Do you feel the same about COMC as those who took the Mosaiq survey? What is it about COMC that makes it a great place for player collecting and set building for you? Did we miss something with our ad? We also want your input on where our future ads should go. What magazines, forums or blogs do you read, and where else can we tell people about COMC.com? For years, we’ve relied primarily on “word of mouth”, as our customers told their friends about us and encouraged them to become new customers. And, for that, we’re thankful. Now, as we grow, we know our voice has to grow, too. Please leave your comments below, and as always, keep up with us on this blog, Facebook, Twitter, and our new Google+ page. The other day I ran across this blog post titled Shopping on CheckOutMyCards.com by Joey from squeezeplaycards.com. It is a great read. Very well done, and it has already gotten some good comments/questions.